We love living in the pacific northwest. There's SO much to explore, see, do, eat, experience that it can feel overwhelming at times. 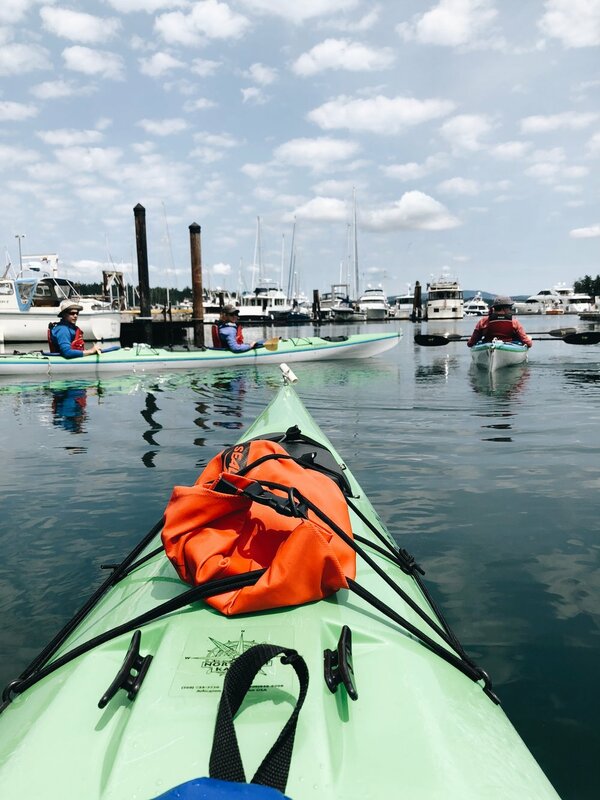 The San Juan Islands had been on our 'must see' list for a while and we were thrilled when the lovely crews at Clipper Vacations and Visit San Juans reached out and offered us a chance to visit San Juan Island + join a whale watching tour and a kayak tour around the gorgeous island. Yes, yes, yes! It came at a perfect time for Matt and I to spend time together before he headed off to Alaska for salmon fishing season. Miss that wild thing when he's gone. We wanted to share some of our favorite spots so you can plan our own vacation to see this amazing place. You'll become quite smitten in no time at all. We spent two days on San Juan Island and part of the fun was getting there! Clipper Vacations made the process seamless. We drove up to Seattle from Portland and caught the San Juan Island Ferry early Tuesday morning and settled in for a 3 hour ferry ride. It was such a dream! Snacks, drinks and a naturalist on board to help guide our ride. It was pretty cold + windy that day but we snuck on the top deck to see some of the beauty as we sailed across. We were both amazed at how quickly three hours flew by! 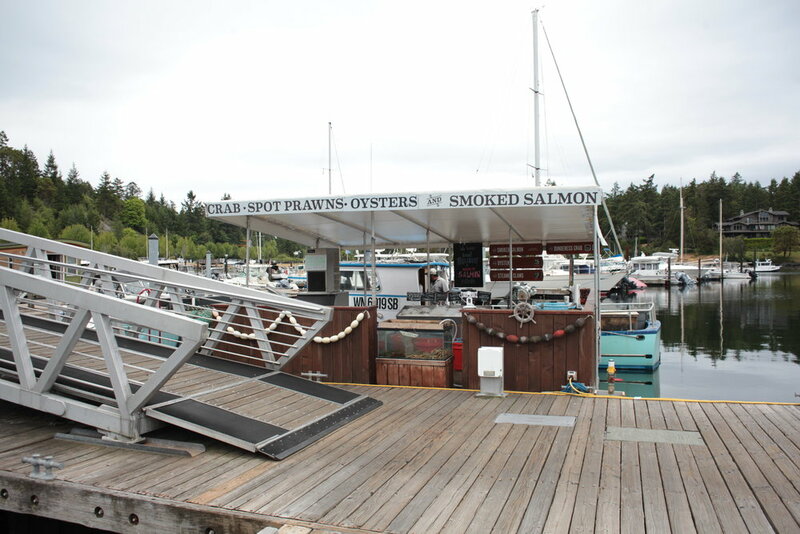 Before we knew it, we had arrived at GORGEOUS Friday Harbor and had a few minutes to explore before our Whale Watching Tour began, also by Clipper. 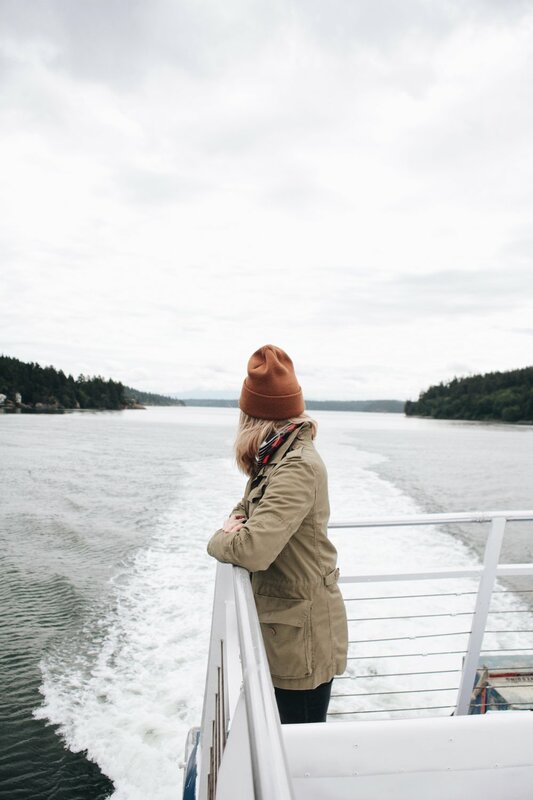 We hopped off the ferry just in awe of how gorgeous the Friday Harbor was. Sunny skies and amazing weather greeted us. But we heard it's perfect about 85% of the time. Sign me up! We walked an easy four blocks from the harbor to our lodging, Earthbox Inn and Spa. There aren't too many places to stay on the island and Earthbox was a total hit. Swimming pool, hot tub, cozy robes in your room, comfie beds and all natural products to use made us feel immediately at home. Plus, the staff was helpful and crazy nice. However, no time to nap because WHALES!! We got a snack then walked back to the harbor and hopped back on the Clipper San Juan Island Ferry in hopes to see some orcas, seals, sea lions, and more. Spoiler alert....WE SAW THEM ALL!! The Salish Sea is one of the world's largest and biologically rich areas and full of spectacular wildlife. This tour is one of the best places to see orca, humpback, gray and minke whales in their natural habitat. Clipper's popular whale watching tour features and expert naturalist who guides and educates passengers about San Juan's local wildlife and whale conservation throughout the tour. We saw five gorgeous orcas!! The naturalist shared that the momma whale was born in 1981, same as me!! That was pretty special. My favorite part of the day was hearing everyone on the boat shout with happiness whenever the whales would come to the surface. It's awe inspiring. Truly. The entire tour is about 2.5 hours and flies by. After the tour, we explored the island a bit more. It's super small so you can walk a lot of places, which we loved. We met our local guide, Amy from the San Juan Visitors Bureau, for dinner that night to hear more about the island. We had seafood at Cask and Schooner (DELICIOUS) and chatted about the amazing things we'd be experiencing on the island. Amy was an amazing tour guide and she knows more about whales than anybody I've ever met! Which was awesome because we had lots of questions. After dinner, we headed off to the room for Netflix + chill time because....vacation!! Plus, we were planning to meet up with Amy early the next morning and explore the south side of the island. WHICH WAS AMAZING! Our first stop early the next morning? San Juan Island National Historic Park at American Camp! It was created in 1966 and based upon an idea - that individuals and nations can solve their problems peacefully without resorting to violence. At this spot in 1859, The U.S and Great Britain almost went to war over a pig shot by an American Farmer. (You can't make this stuff up, people!) It was slightly more complicated than that and the Visitor Center is open Wednesday - Sunday to help answer all the questions! We walked the grounds, saw an eagle's nest, learned from the locals and explored the beautiful South Beach. We saw deer, bald eagles, fox and a snake that narrowly missed slithering right over my shoe. It's cool. We handled it. ;) And by handled it, I mean I shrieked while the scared little guy took off. Next stop?! Oh man I am excited to share Pelindaba Lavender Farm with you because it was enchanting! And they had so many yummy products to taste and try! Pelindaba is a premier grower of lavender plants, distiller of lavender essential oils and handcrafter of lavender products. We tried (and purchased for ourselves) lavender vanilla ice cream, lavender lemonade, lavender hot chocolate, lavender balm, lotions and more! They cultivate the flowers in organically certified fields and extract the essential oil in an on-site distillery. 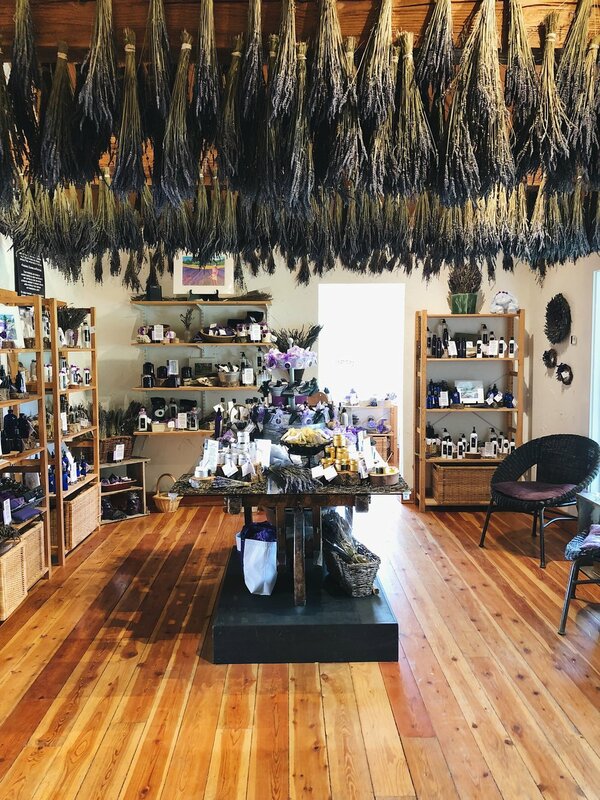 There's a general store and an interactive walk through area that teaches you how they create their essential oils. It's fascinating! And that ice cream was divine! Thankfully, they have a Portland location which means I can fulfill my homemade ice cream fantasies all summer long. 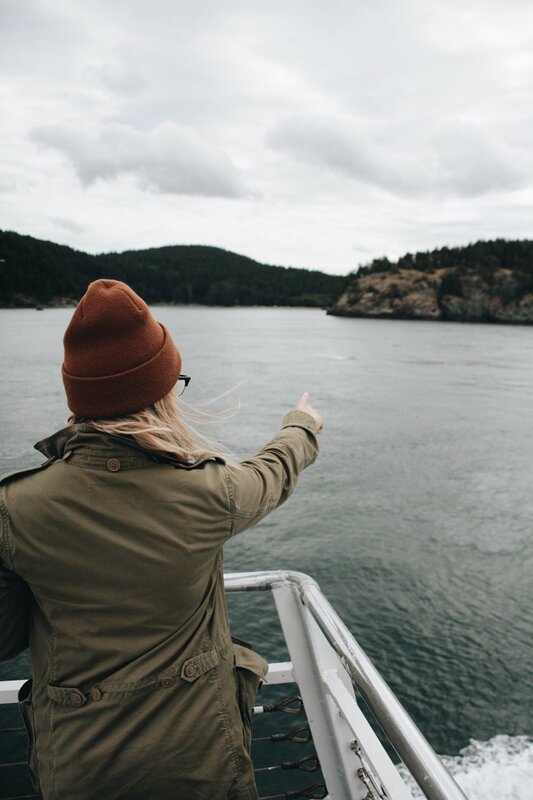 Just a few miles away is Lime Kiln State Park, also known as Whale Watch Park. This is one of the best places in the WORLD to view whales from shore. The park is stunning, even without the chance of spotting whales. It's located nine miles west of Friday Harbor and is a 36 acre park which has 2,550 feet of waterfront overlooking Haro Strait to Victoria, BC. There are hiking trails, a visitor center + gift shop, an amazing 1919 lighthouse which offices whale experts to help answer questions and a restored lime kiln. We came here twice. It was that good. We parted ways with our sweet tour guide, Amy, and headed back to Friday Harbor for a quick lunch before our Clipper Kayak Tour! I'm not the best kayaker in the universe (faaaar from it) but this tour was perfect for total beginners or mega experts, like my fella. The San Juan Islands are considered one of the top sea kayaking destinations in the world. Paddling this area offers rugged coastline, expansive ocean views, snow-covered mountains and marine life sightings - like orcas, seals, sea lions, jellyfish, eagles and more. We held a non stinging jellyfish and Matt found an oyster.....and ate it. Ha! This tour was a blast! Kayaking is such a fun and interesting way to explore the coastline. We were able to see areas you could never see on foot. We loved it!! The hours FLEW by! The tour groups are small so you have plenty of chances to ask questions and learn about the beauty you're surrounded by. This kayak experience is a must do! I was actually nervous but I promise you can do it and you'll be so happy you did. 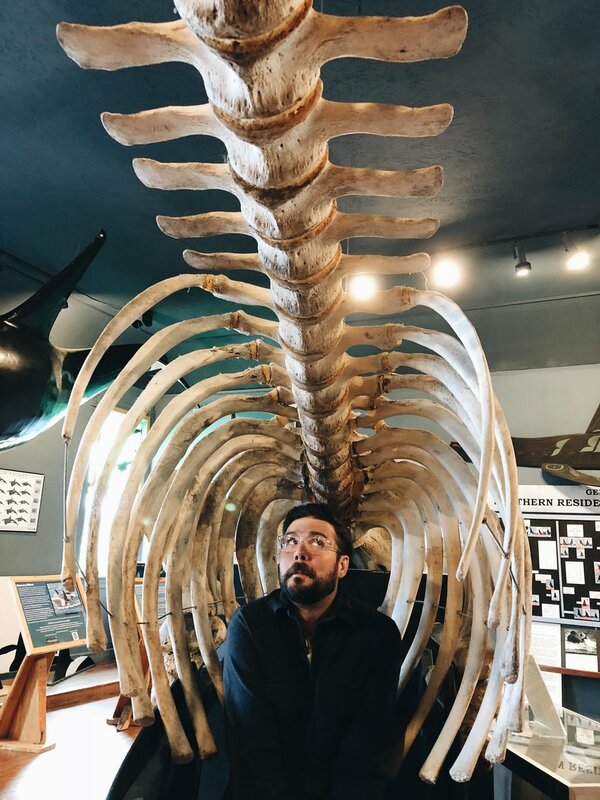 After kayaking, we had just enough time to grab tacos then visit The Whale Museum! This museum is incredible. This is the first museum in the world to promote the stewardship of whales through education and research. It's full of engaging interactive exhibits that teach about the Salish Sea ecosystem and the marine mammals that inhabit it. It's perfect for kiddos and adults, alike! Matt even brought home some local artwork from the gift shop. This place was a blast. Next stop? A movie at the local theater. We saw Solo. (I let Matt choose.) And ya know, it was great!! We walked around Friday Harbor after the movie and it was gorgeous by moonlight. San Juan Island is incredibly safe and clean. I really, really loved that about it. And so quiet at night! Which brings us to naptime before our last day on the island. The next morning, we had coffee then walked over to Susie's Mopeds to pick up our wheels for the day. We wanted to explore the north side of the island, which was about a twenty minute drive from Friday Harbor. You can drive around the entire island in less than two hours! We got a scoot coupe, which has been an island tradition since 1986. I was slightly nervous about this but it was PERFECT! You HAVE to rent one of these! 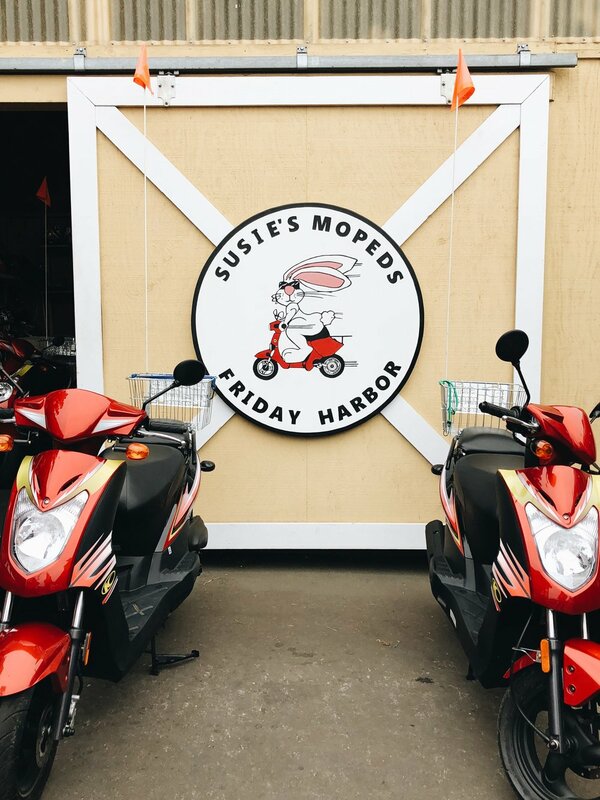 I let Matt drive (obviously) but the crew at Susie's Mopeds hooked us up with helmets, blankets and a map marked with all of the places we had to stop and explore. 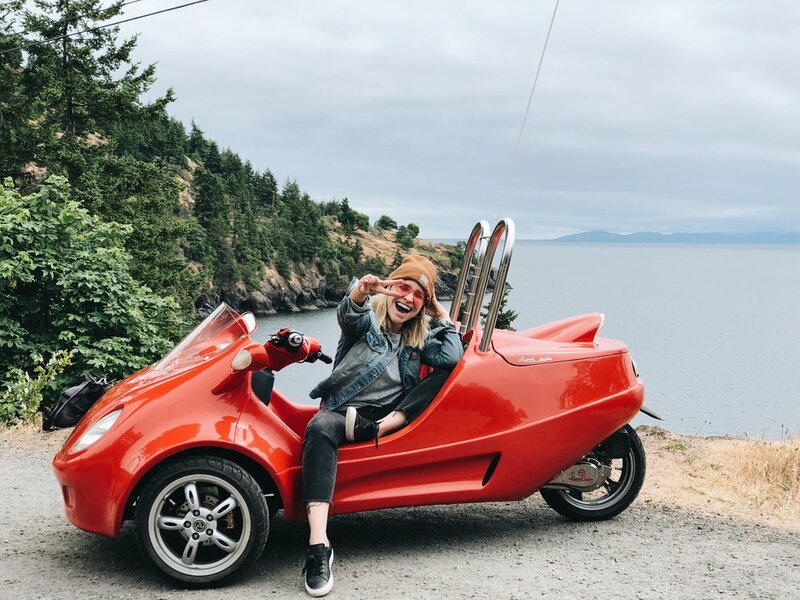 We were giggling at how amazing these little three wheelers were and had a blast scooting around the island. You can also rent a moped or bicycle, but I would highly recommend the scoot coupe. It's just so unique!! Got a quick rundown then off we went to Roche Harbor! Roche Harbor BLEW my mind! It was gorgeous! We had an amazing breakfast at Lime Kiln Cafe then explored a bit. I felt like we were in a Disney movie. No joke. It's that gorgeous. 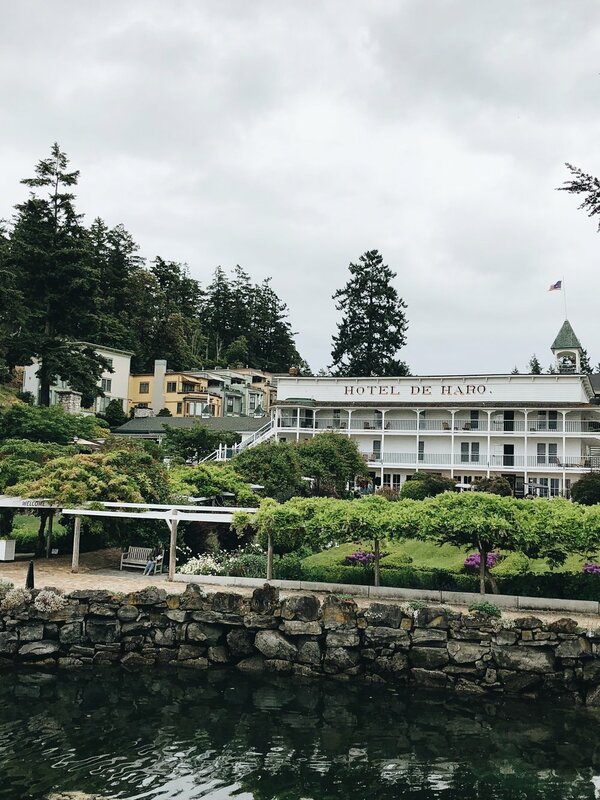 Roche Harbor has five different lodging options with activities to fit anyone's style. You can book a Clipper Kayak Experience here as well. We're definitely doing that next time. Roche Harbor is small but amazing. We really loved it. We had a few more hours left to explore before catching the ferry back to Seattle so we kept driving down the island loop and got more lavender ice cream plus stopped off to hike at Lime Kiln State Park. Matt loved this place. It was truly amazing. We arrived back safe and sound then got coffee and clam chowder before boarding our ferry back to Seattle! There were so many more spots we wished we could have visited during our short stay but we saw enough to know we'll be back. We want to send a huge thank you to the amazing team at Clipper Vacations and the wonderful crew at Visit San Juans for helping make this trip a dream. They are the perfect vacation planners and will make sure your trip is tailored perfectly for you. San Juan Island exceeded every expectation we had. I can't wait to take both of our parents back for a trip! Thanks for following along! Much love to you. Newer PostVan Life with GoCamp!